VISALIA – The old lumberyard in downtown Visalia might not look like much today, but it was at one time the hub of commerce for the entire Central Valley. 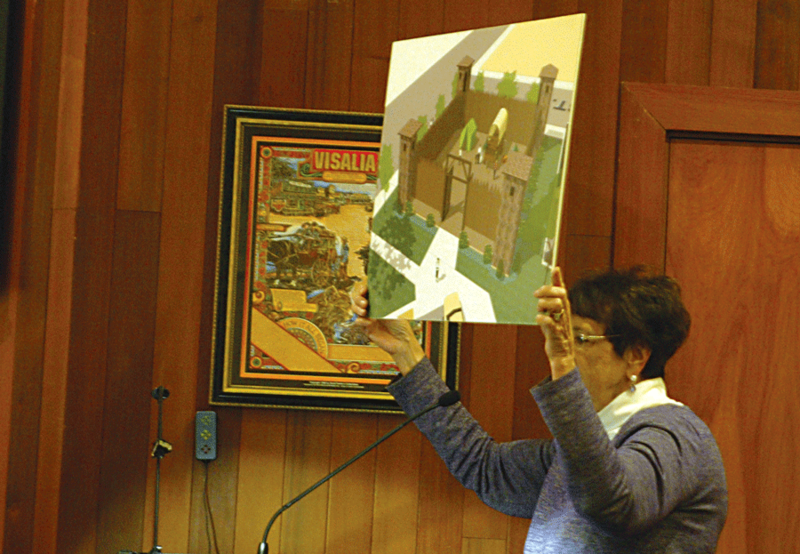 At its Jan. 22 meeting, the Visalia City Council accepted a report from a historical research consultant identifying the block of land between Bridge, Garden, School, and Oak streets as the likely location of Fort Visalia, the first community structure built in Visalia and the possibly the entire San Joaquin Valley. Local historian Terry Ommen asked for the item to be pulled from the consent calendar to give the councilmembers a brief history lesson on their city’s first structure other than a cabin. Ommen said Ft. Visalia was built in the fall of 1852 by settlers who came by wagon train from Iowa. It was home to many historical figures including Nathanial Vise, whom the city was named after, Nathan Baker, the city’s first general store merchant, and Ruben and Osee Matthews, whose grist mill was the first to provide wheat and flour to the area. Mill Creek and Visalia’s first road, Mill Road (now known as Main Street), were both named after the Mattews Brothers Grist Mill. It was also home to Edgar Reynolds, whose youthful journaling has provided historians like Ommen with an idea of what the fort looked like and where it was located. Reynolds’ writings describe the fort as having 14-foot high walls made of oak tree trunks to create a 60-square foot interior. There were jutting structures on the corners where the guards could look down the wall for any suspicious activity. Ommen said the fort was used primarily at night when the settlers would bring their wagons and supplies within the walls for protection while they slept. But it also served as a place to have nighttime dances and gatherings. “They felt they were in danger at night when it was difficult to see and they had guards watching at night,” Ommen said. The settlers felt the need to build a fort to protect themselves from Native American tribes because of a terrifying turf war just two years earlier. In 1850, John Wood and a group of 10 settlers were living in cabin known as Woodsville, near the current location of the old Venice Hill School on Road 180 north of Avenue 312. That December, a group of Indians warned the settlers to leave their land and gave them 10 days to comply. On the 11th day, the Indians made good on their promise and killed all of the settlers. But the early settlers in Visalia had a very different experience. Ommen said they found the natives weren’t a threat at all, and for the most part stayed out of the Tule Indian War between setters and the Tule tribe in the Porterville-Springville area. In some cases, they even provided natives a safe refuge from the war. By 1855 Visalians had abandoned use of the fort and it was torn down. “We deserve a chance to know more about that and this could be a great outdoor classroom for future history learners,” Ommen said. Ommen said the structure was not only historically significant in the history of Visalia, but also to the history of California. Visalia was founded in 1852 and is the oldest valley town still in existence between Los Angeles and French Camp just south of Stockton. Visalia predates Bakersfield, Fresno, Merced and Modesto, just to mention a few. Tulare County was established in 1852, two years after California became a state. The county predates Fresno, Kern, Inyo and Kings counties—all of which were generally included in the original boundaries of Tulare County. Starting in 1853, Visalia was the county seat of the once gigantic Tulare County. Ommen said Visalia was a stop on the Butterfield Overland Mail route (1858-1861), one of the few towns to have a U. S. Land Office for settlers to register their claims if they wanted homestead land, had a telegraph office on the Atlantic & Pacific Telegraph line by 1860, had a Union military garrison stationed here during the Civil War, and the first newspaper in the southern San Joaquin Valley, the Tulare County Record & Fresno Examiner, which began in 1859. Susan Mangini also spoke at the city council meeting. With a drawing of what the fort may have looked like in hand, Mangini told the council she would like to see the old lumberyard property be turned into a park where the fort could be recreated as a historical point of interest for local school children and tourists alike. “This is a passion for me and it’s a wonderful opportunity to look a something bigger, a vision for a city park where Ft. Visalia could be recreated,” she said. Ommen said he doesn’t see a reconstruction of the fort as a something that is practical because it would require ongoing maintenance at a cost to the city. He suggested a commemorative marker that could include an expanded historical interpretation of the site and include an artistic rendering of the fort as it was described by witnesses and found in the historical record. The Applied Earthworks (AEW) report concluded that there is very little probability of any significant structural or physical remnants of Fort Visalia, or “unique archaeological resources,” on the site. There is however a high probability that there is the presence of “nonunique archeological resources” in the form of refuse debris on the site from a variety of site occupation activities, which may include refuse debris from Fort Visalia. Ultimately it would be difficult to make determinations of refuse debris that are found on the site as being directly related to the time of occupation of Fort Visalia therefore the report does not identify any significant archeological resources that would trigger a mandatory archeological excavation project on the site. Ommen requested that archeological testing be used in an attempt to identify the exact location of the fort within the block prior to new development on the block. “As much as possible, archeological work on the site should take place prior to the sale and development of the property so the archeological work will not hold up future development of the site,” Ommen wrote in a letter to the council. Ommen also suggested that the area should be fenced with “no trespassing” signs posted to keep those not part of the project from disturbing historical objects.